Blog promotion is very important to stay interacted with your audience, and on social media, and to up those statistics. It is very hard for some people to stay focused on this aspect of blogging, me being one of them, so I found out about 6 months ago that there were APPS/websites to help you with this. Many of these APPS/websites have been created to help boost your promoting/advertising game with your website/blog. I am still on the hunt to find more after trying some but these are the ones I use on a regular basis. My go-to app when I have a new post coming out or want to promote older content. Buffer is the easiest APP to use and get around with. I have had it ever since I moved to China as, because of the time difference, I am unable to promote my blog at the times I want to in the UK. It is also handy if you are going out the next day and don’t have time to tweet or instagram the whole day. Without a subscription, you can schedule up to 10 posts each time, which is plenty for me, and organise up to 5 social media profiles. With a subscription ($102/year), this allows you to schedule up to 100 posts each time, allows you to set up 10 social media profiles, adds in a social media calendar and accepts Pinterest scheduling. Either way, they are both good deals, and I am more than happy to stick to the free subscription. Later is similar to Buffer but, in my opinion, it seems a little more complicated in terms of structuring a post. It is also very time consuming. 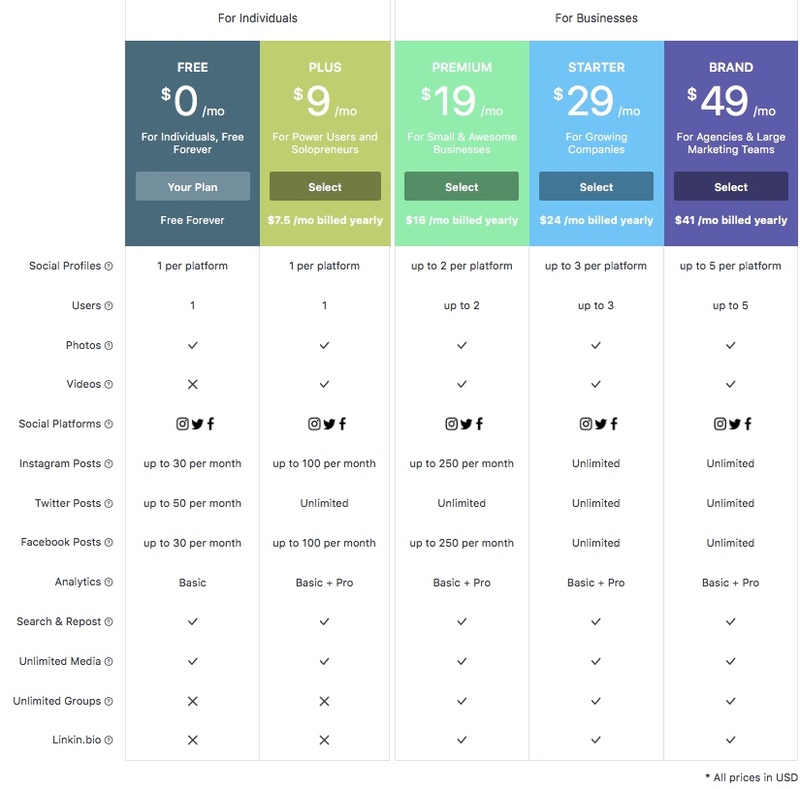 The photo below shows the different subscriptions you can apply for; I have the free one which is more than enough for me as I only use it for Instagram and Pinterest. I have only recently started using Later so I am still trying to get used to it and how it works. With Instagram posts, you set up the structure, caption and photo and when it comes to the day and time of posting, it sends the alert to your phone and you have to physically upload it yourself. Therefore, it isn’t really scheduling a post for you. This is annoying in my position as the most common and popular times to post Instagrams are usually in the evening when I am already asleep here. 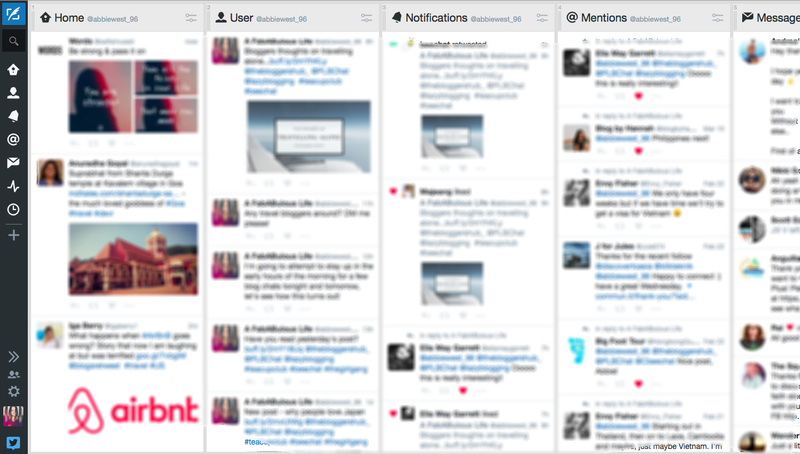 Tweetdeck isn’t any form of scheduling website but it allows you to manage all aspects of your twitter in one place so you can, in a way, multitask on twitter. You can read your DM’s whilst seeing what your latest notification is, write a tweet whilst reading a reply in your DM, glance at your mentions whilst writing a tweet; it’s comes in handy when you are participating in a blog chat. You can even create a column especially dedicated to a certain follower or a hashtag so you can easily find those tweets without having to scroll down your feed for, what will seem like, forever. Do you use any of these APPs? What other APPs do you use? What Have I Gained from Blogging? "What to do for a Weekend in Shanghai"
"How to Spend an Evening at Home"
Buffer is the best! I use it to schedule all my blog tweets, so that I don't overwhelm the retweet accounts.